Meditation & Spiritual Life Practice Community - "A heart in boundless intimacy & endless gratitude is enlightenment itself". "A heart in boundless intimacy & endless gratitude is enlightenment itself". 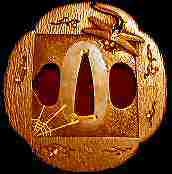 Zen Teachings on Embodying Boundless Intimacy and Ungraspable Enlightenment in Everyday Life. Hlleo, I have just joined today. The Way of Masters and Students...virtuous path of enlightenment! Started by Dr. Bonnici in Dr. Bonnici's Question on Spiritual Practice Jan 2, 2015. Started by Vlada Mikahl Schoon in Dr. Bonnici's Question on Spiritual Practice. Last reply by tom holliday Nov 10, 2011. Started by Binay Maharjan in Discussions on Living a Spiritual Life Jul 27, 2010. Started by Tony Bonnici in Dr. Bonnici's Question on Spiritual Practice Jul 25, 2010. Started by Vlada Mikahl Schoon in Dr. Bonnici's Question on Spiritual Practice. Last reply by EVELYN Jun 16, 2010. Started by Mark Burbank in Dr. Bonnici's Question on Spiritual Practice. Last reply by Mark Burbank Jun 5, 2010. Started by Mark Burbank in The Body of Faith.. Last reply by ioana petrova Jun 4, 2010. Started by EVELYN in Dr. Bonnici's Question on Spiritual Practice. Last reply by ioana petrova Jun 2, 2010. Started by Vlada Mikahl Schoon in Dr. Bonnici's Question on Spiritual Practice. Last reply by ioana petrova May 31, 2010. Started by Vlada Mikahl Schoon in Dr. Bonnici's Question on Spiritual Practice. Last reply by Vlada Mikahl Schoon May 30, 2010. Started by Vlada Mikahl Schoon in Dr. Bonnici's Question on Spiritual Practice. Last reply by Vlada Mikahl Schoon May 28, 2010. Started by Gina Roman in Dr. Bonnici's Question on Spiritual Practice. Last reply by Mark Burbank Feb 8, 2009. Started by Gina Roman in Discussions on Living the Body of Meditation. Last reply by Mark Burbank Jan 25, 2009. Started by Virgilio S. Antonio in Dr. Bonnici's Question on Spiritual Practice. Last reply by Mark Burbank Jan 11, 2009. Started by Dr. Manjukumar in Dr. Bonnici's Question on Spiritual Practice Dec 28, 2008. Only Moment Body is the root of the Bodhi tree. Our five senses are a Great Round Mirror bright. Resting intimately in our Wisdoming Core, no speck of knowing, ego-self, or knowledge alights." 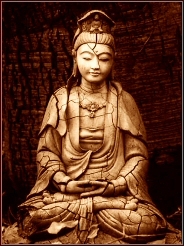 Jizo Bodhisattva embodies the aspiration to save all beings from suffering. He is the guardian of expectant mothers and travelers. Most of all, he is the protector of deceased children, including miscarried, aborted or stillborn infants. I am a 75 year old Master Zen Teacher and Counselor with a Doctorate in Humanistic Dept Psychology. I received my doctoral degree in 1978 from Saybrook University in San Francisco, California. Over the last 40 years, it has been my joyful and passionate calling to provide somatic training and growth counseling in Applied Meditation Therapy®, lead Zen meditation practice groups in California and Hawaii, and give public talks and bodymind skill workshops on living meditation as the core wisdoming process of everyday life. In 1996, I created ZenDoctor.Com to promote greater public awareness of Applied Meditation Therapy and to globally extend my teachings as a humanistic counselor and a Zen Roshi to the global Internet community. Also, since the creation of my website, I have been providing Telephone & Video Counseling & Training to people worldwide. While working on my second book entitled Zen Intimacy, I continue to write articles in Europe and America on spiritual growth, optimum wellness, behavioral wisdom, compassionate action and peak human embodiment. As an extension of my worldwide teaching, training and counseling, I am happy to introduce this spiritual network community. Here people from all around the world can learn about living from their Only Moment Body of enlightenment and the bright wisdoming of their core Self. On my online community you have access to my audio talks, written teachings, poetry, and inspirational videos. I encourage you to put into daily practice the skills and principles outlined in my Audio Talks, Published Articles and Waymarkers. You can access these from the menu line above or at my central teaching site at ZenDoctor.Com. This Online Community is also a safe place where you can openly dialogue about your spiritual and meditation life journey. Here, you can support each other by practicing sincerity, authenticity, and compassion as you express your thoughts and feelings on living meditation, mindfulness, faith body, and the farther reaches of human nature. I encourage you to share your experiences, comments, and questions with integrity, humility and beginner's heartmind, for these are the true hallmarks of your core Self and the wisdoming of your Only Moment Body before attainment or gain. The fundamental purpose of this online community is to provide a contained refuge and a safe haven for spiritual fellowship and honest inner journeying. As such, it is not an appropriate space to market or advertise products or other websites and social networks with embedded audios, videos, photo albums, or rss feed aggregators. I appreciate everyone honoring these parameters so that together we can nourish and sustain the deep inner refuge and upright spiritual container that this online community represents. "aloha and happy holidays to you Dr. Bonnici ! :o)"
"Welcome Bernardo! Enjoy the community. If you have any questions, please do not hesitate to ask. with blessings, De. Bonnici"
""Welcome Louise, Glad to have you as a member of our spiritual community. Enjoy this site! If you have any questions, please do not hesitate to ask. with blessings, Dr. Bonnici ""
Teaching, inspiration and guidance for the beginning of our 2010 journey around the Sun. 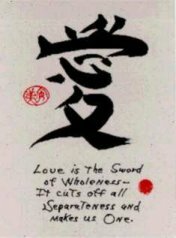 Shoshin is a Japanese term that means 'beginner's heartmind'. 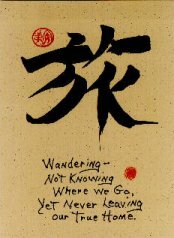 Shoshin is exactly the heartmind of playfulness, wonder, faithfulness and childlike curiosity. It is exactly this Only Moment Body of simplicity, naturalness and spontaneity. Beginner's heartmind rests in the effortless authenticity of stone, bark and earth. Shoshin is the life force of joyful wildness that is exhibited by all young creatures of sea and land. All the Ancients who practiced the original body of meditation have proclaimed this beginner's heartmind as truthfully present, immeasurably deep, and endlessly profound. Our sincere intention in living meditation as the Way of the Ancients is to simply be the joyful playfulness, wondrous clarity and profound wisdoming of our original heartmind, our beginner's heartmind, that is exactly this Only Moment Body. When we first dedicate our life to practicing meditation as beginner's heartmind, we vow to live this Only Moment Body as the Way of openness, clarity, compassion, and bright wisdoming. To arouse this vow of beginner's heartmind is to arouse the deep intention to embody the Way of Only Moment Body and listen to the calling of Vast Wisdoming from within. The constant practice of being this only moment and listening to the Way of Vast Wisdoming is called 'beginner's Way-seeking heartmind'. Beginner's Way-seeking heartmind is not looking to find the Way, but rather confidently being, doing and listening to the Way of Oneness and Vast Wisdoming in this Only Moment Body. As endless beginners, we listen and respond to our deep inner calling so that we may continue to live in accordance with the vast wisdoming of our core Self, our true nature and the unique unfolding of our life moment by moment. Beginner's heartmind means to just be our Only Moment Body while practicing deep listening and felt intimacy with the Oneness of a Vast Wisdoming that is beyond our ego-self and thinking mind, beyond our grasping and pushing away, and beyond the duality of life and death. When we listen deeply with confidence, clarity and openness to the guidance of Vast Wisdoming and the emergence of our inner calling, we become ever intimate with the three joyful marks of our beginner’s heartmind. The first clear mark of beginner's heartmind manifests as the joyful zazen practice of being this Only Moment Body while molting off self-preoccupation, endless grasping, mental agitation, frantic activity and driven behavior. The second clear mark of beginner's heartmind manifests as the joyful zazen practice of being this Only Moment Body while shedding self-doubt, vanity, defensiveness, ignorance, self-delusion, anxiety and fear. 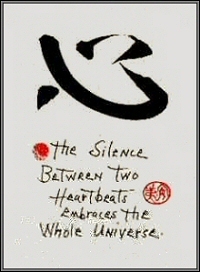 The third clear mark of beginner's heartmind manifests as the joyful practice of satiating all our desires in the silence and stillness of zazen meditation while arising as this Only Moment Body to engage the unfolding of our life journey with passion, vitality, joy and caring for all sentient beings. These three marks of beginner's heartmind help us to live from the compassionate wisdoming of our True Nature while nourishing a wondrous openness, confident readiness and wholehearted presence to meet the challenges of our everyday life with creativity, faith, integrity and courage. Meditation & Spiritual Life Practice Community. 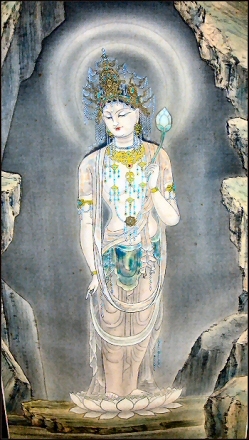 Kannon, also known as Kwan Yin in Chinese, is "she who hears the suffering of humanity and responds with compassion". She is the embodiment of the loving compassion that is within all human beings, just as they are, just as IT is. "Every morning our thoughts Are on Kannon. Every evening our thoughts are on Kannon. Each moment is exactly the arising of her Compassion Body. The vastness of Time and Space is exactly the infinite embrace of her nurturing Womb."